Starpoint Alpha had us intrigued from the second we made its booking. Explicitly no mobile phones or digital watches are allowed in and if you have a pacemaker fitted it was advised that you contacted Clockwork Escapes to discuss. In all of the escape games we’ve played, we've never read such cautions - what were we about to uncover inside this room? Watches and phones safely stowed, we arrived at the venue in Wolverhampton to be met by ’Professor Clockwork’ - an eccentric fellow, suitably accessorised with a top hat and cane. With his well-spoken, booming voice and razor sharp wit we disjointedly likened him to a steampunk'd Victorian lovechild of Boris Johnson! …with the former being far more endearing of course. We started our game in an area which on first impressions we found a little underwhelming. 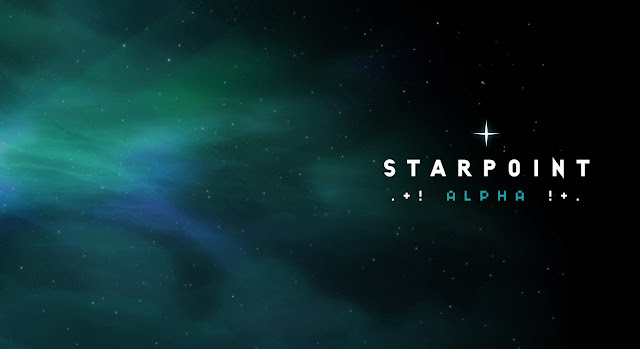 We need not have worried though, as the initial canny puzzles soon opened Starpoint Alpha up to its fuller potential. The impressive decoration of the space station and its build quality was of an exceptionally high standard. So much so that suspending belief that you're merely within a nondescript building in Wolverhampton’s city centre was surprisingly easy to do. It offered effortless immersion. We found an excellent balance of puzzle styles within the room. With amusing whimsical elements that admirably counterbalanced the more ambitious, mentally challenging tasks that came at varying levels of difficulty, a number of which required strong communication within the team in order to succeed. There was also plenty of impressive technical elements - and to our surprise, some traditional aspects too. Whilst you’d be forgiven for assuming padlocks would look out of place on board a futuristic space shuttle, somehow they still worked. It's also worth highlighting the refreshingly original puzzle ideas that will satisfy even hardened escape room enthusiasts who may think they've 'seen it all before' - a testament to which we doff our hats to Professor Clockwork and his team! The pleasing flow of puzzles was bolstered further by the humorous assistance of our games master, whom never dropped character throughout our entire time at Clockwork Escapes. He timed his witty interventions during our gameplay to perfection. The smart requirement that players complete progressive sub-missions here also did well to provide triumphant moments of secondary achievement. This also assisted the awareness of your progress to its overall end game - suitably adding to the rooms time pressure and your earnest to escape. 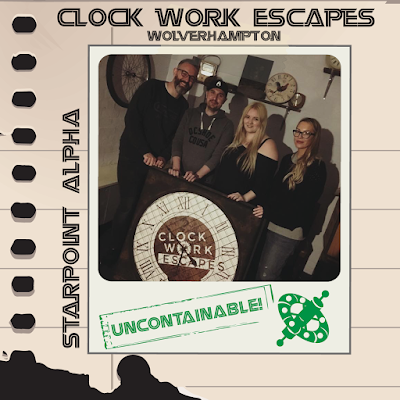 Starpoint Alpha’s puzzled-packed plot, along with its attentively invested games master and big climatic finish cumulated together to offer a cosmically enchanting escape room experience.